Great looking bracelet! Clasp seems secure and the leather doesn’t smell strong. Good communication from company. Perfect fit and looks great on him. He loves it! All bracelets are in stock. With so many great choices in men’s bracelets, feel free to get creative and express your personality. Use the filters below if you’re looking for a specific color, size or material. A bracelet is an important part of a complete wardrobe, a stylish display of confidence and personality. Below are answers to most frequently asked questions. They'll help any man find his favorite new bracelet. We carry men's bracelets in a wide variety of materials, so no matter what you're looking for, we're ready to help you find it in our collection. 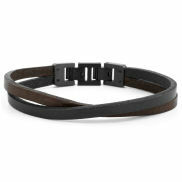 The vast majority of leather bracelets at Trendhim are made from 100% cowhide leather. Bracelets are often made from split leather, top layer leather or whole grain leather. Whole grain leather is very rigid and often too thick for bracelets. 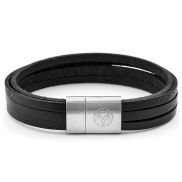 Most of the bracelets we sell at Trendhim are made from the highest quality top layer leather. Our high standards provide you with the finest quality leather that just gets better and more comfortable with use while keeping its wonderful leather scent. Almost all steel bracelets available at Trendhim are made from 316L stainless steel, better known as surgical-grade steel. 316L surgical steel is super high quality and perfect for making jewelry. It keeps its brilliant shine and polished beauty for many years and is very resistant to wear, rain, snow, and even sweat. Beaded bracelets for men have recently made terrific gains in popularity. 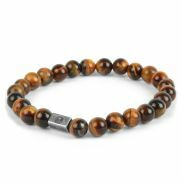 We offer beaded bracelets for men with both wood and natural stone beads. Because our pearl bracelets are made from natural stones that vary in texture and color, no two bracelets are alike, each being completely unique. Most of our men's beaded bracelets are made ​​from beads that are 0.24", 0.28" or 0.31" in diameter. Boy's bracelets are also made from natural materials, so all beaded bracelets are good for males of all ages. If you have very small wrists or are looking for small men's bracelets, you can use a measuring tape and then consult the chart at the top. Select by category and filter the bracelets for anything under 7.2". The vast majority of young males have wrists of about 5.9" - 6.7". Use our sizing guide to help determine the right size for your wrist. How to find the size of the bracelet? The best way is to measure the wrist just above the wrist bone, then add about 0.8" as shown here. The measuring tape shouldn't wrap around too tightly when measuring. The wrist shown in the picture is 8.2", so, adding 0.8", the proper ordering size for this wrist would be 9". If, for whatever reason, you can't measure the wrist (for example, if the bracelet is a gift to someone) here are some good rules of thumb to guide you. Just click on the "Size" button on the menu at the top of the page to select the size you want. We offer a large selection of men's bracelets. One thing that differentiates one bracelet from the next is the type of lock mechanism they're equipped with. On this page, you'll find descriptions of all our lock varieties. The bracelet is locked in place by tying the two ends of the cord into a knot. This also enables you to easily adjust the length of the bracelet. A round knob is simply pushed through pre-punched holes to solidly hold the leather bracelet into several locking positions. There are also plastic insert locks on the sporty paracord bracelets. This category has a wide variety of locks that include snap-shut rivets, belt buckle style, lobster claw, insert twister and metal watch strap clip shut style locks. All of these metal locks ensure firm and reliable locking positions. This kind of lock has a metal object with a couple of holes in it where the end of the bracelet is pushed through and locked into place, providing a great variety of possible length adjustments. This category also includes loops that simply pull over a metal piece. A magnet lock ensures an extremely secure locking position, allowing you to safely wear your bracelet in everyday activities. Magnet locks are often coupled with twist locks for double security. Note that several types of locks make it possible to adjust the length of the bracelet.